I often buy knitting magazines for inspiration. Most of them include 'free' items, such as wool or stich markers, in addition to the patterns. I like to use the wool for small projects like knitting baby hats for expectant colleagues. 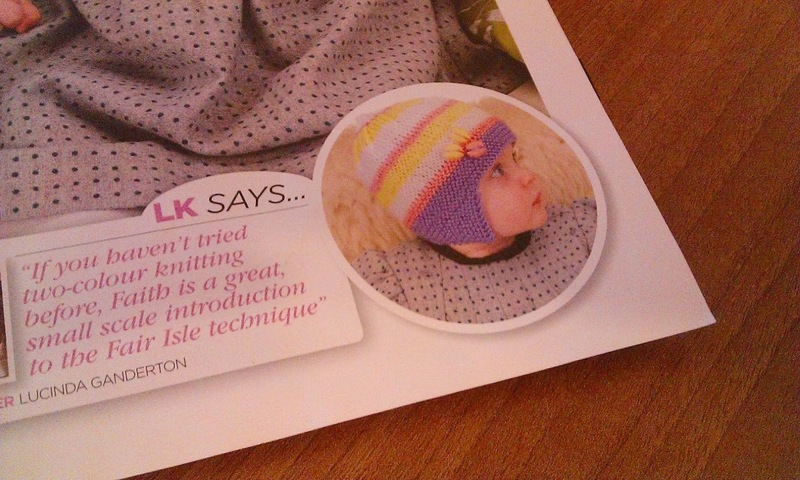 One of my favourite patterns comes from the January 2012 'Lets Knit' magazine available in the UK. 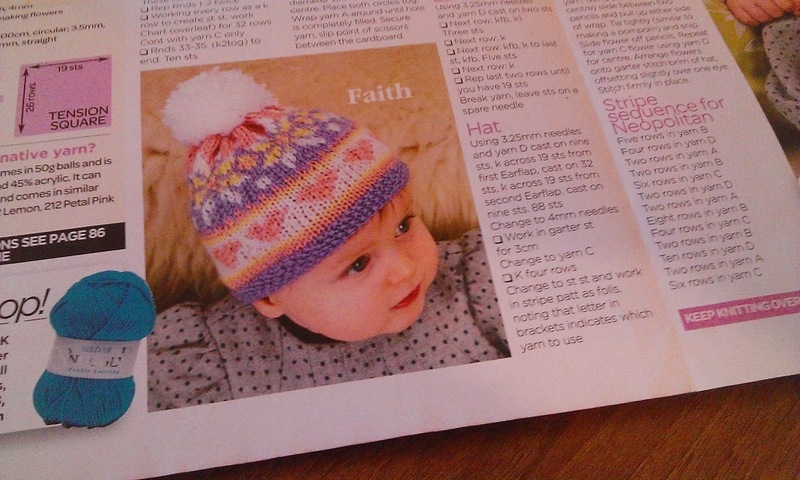 It's a fair isle pattern called 'Faith', but I've found that in the chilly winter months here in the north of Scotland, baby hats should really have ear flaps. Luckily the same pattern pull out included a pattern called 'Maisie' which did have ear flaps. That got me thinking about how I could combine the two patterns to add ear flaps to the pattern I wanted to knit. Pattern adapting to the rescue! You could apply this to any baby hat pattern designed to fit 0-6 months, knitting from the brim up, using yarn equivilant to Sidar Snuggly DK, and knitting stocking stitch at a tention of 19 sts x 26 rows on 10 mm needles. I include the pattern for knitting the ear flaps so you can adapt any pattern you already have. Technicalities over, this is how I did it. With my ear flaps in hand and a total of 38 stitches, I subtracted this number from the total number of stitches I needed to cast on for my hat pattern which is knitted in the round (in this case it was 80 stitches in total). I then took this figure and halved it to give me the number of stitches I needed to cast on inbetween my ear flaps. That meant I cast on 21 stitches, then transfered over the 19 stitches from my first ear flap, cast on another 21 stitches, and transfered over the 19 stitches from my second ear flap, joined the round and jumped straight into the first row of my hat pattern. If your pattern is not in the round, you would need to do the following. Halve the number of stitches you need to cast on between the ear flaps, which was 21 stitches, and cast on this number of stitches. Obviously, if the number is not a whole number, as is the case in my example, you need to round up to the next whole number and cast on that many stitches (in this case 11). Now transfer over the first ear flap, cast on the number of stitches between ear flaps (21 stitches), transfer over the second ear flap, and then cast on one less stitch than what you cast on first (this would be 10).